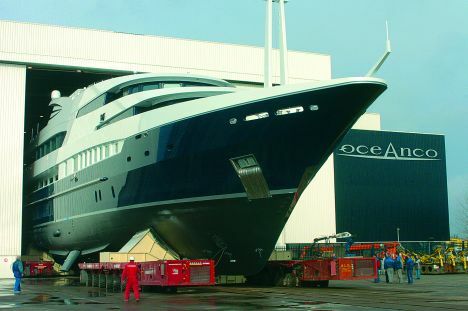 Oceanco, the shipyard that entrusts the building of its boats to the German Kusch Yachtbau - famous for its skilled labor - and the finishing touches to Alblasserdam Yachtbuilding BV in The Netherlands, is finishing the 60-meter superyacht "Alfa IV" with stainless steel hull and aluminum superstructure. The yacht's interiors were designed by the Yard's office in collaboration with the well-known architect Andrew Winch. The solutions adopted for the "Alfa IV" in the lower deck include four staterooms with single beds, one guest stateroom with double bed and eight double cabins for the crew, all fitted with en suite bathroom. The captain has a suite with double bed and the Owner stateroom, fitted forward of the main deck, includes a small private panoramic salon, two walk-in closets and two en suite bathrooms. The galley, the dining room and the salon fitted with the most state-of-the-art multimedia systems are on the main deck as well. The upper deck includes the full-breadth dashboard, aft of which there are two side garages serving as storage for two tenders. The stern area includes the dinette and a salon for relaxation. The flying bridge is fitted with an open-air fitness area, a wide swimming pool and a sunning area aft, which may be converted, if necessary, into helipad. For further information contact Monaco Oceanco office: Gildo Pastor Center; 7 rue du Gabian; MC98000 Monaco; tel. (+377) 93100281; fax (+377) 92056599; e-mail oceanco@oceanco.mc; website: www.oceancoyacht.com.